Art historians are well known for their ability to forge imaginative and often memorable monikers for artists whose identities remain unknown. Like the ‘Maestro della Santa Caterina Gualino’: Giovanni Previtali coined this title for the mysterious Italian sculptor of a series of fourteenth-century figural sculptures. National Museums Scotland is home to one of his masterpieces. The Master of the Gualino St Catherine is the title we now give to an artist whose real name is unknown. Still profoundly enigmatic, he was active in Central Italy in the early 1300s. 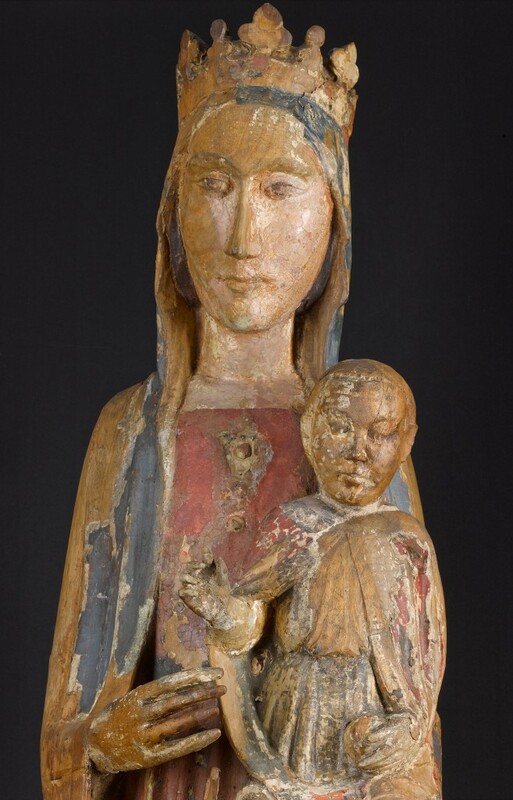 The art historian Giovanni Previtali, who first set about reconstructing his artistic biography and catalogue raisonné in the 1960s, named this master after a beautiful polychrome wooden figure of St Catherine. This statue had been in the collection of the Italian industrialist Riccardo Gualino in Turin. 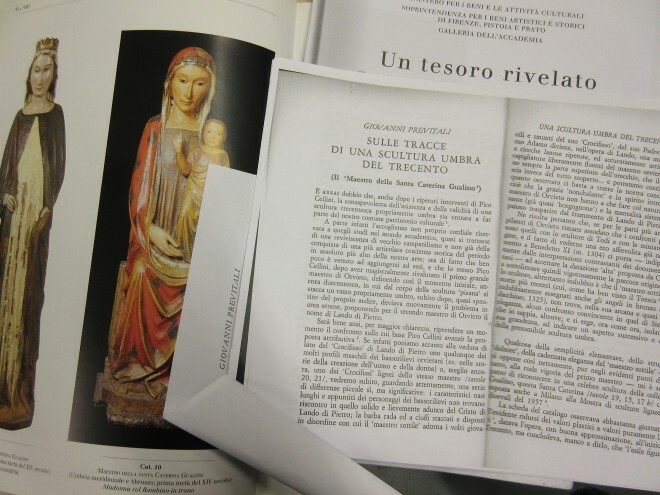 Today it remains in the same city, albeit in the hands of another connoisseur (see Dr Rachel King’s blog post of 24 December 2015, documenting our recent research trip to Turin). Previtali used stylistic comparison with this piece in Turin to attribute a series of works, mainly polychrome wooden devotional Madonnas, to the Master. These include a monumental Madonna and Child originally in Teramo Cathedral (the Abruzzo) and now in the episcopal palace there; and a large red-mantled Madonna and Child of documented Umbrian provenance. The latter work, formerly in the hands of a private collector in Florence, has just been acquired by the newly re-opened MUNDA (Museo Nazionale d’Abruzzo) in L’Aquila. (The Museo Nazionale d’Abruzzo was forced to close following the earthquake that devastated L’Aquila in 2009 and re-opened on 19 December 2015). Previtali inspired his students to join him on his hunt. Giovanni Romano, a pupil of Previtali, became aware of the Edinburgh Madonna and Child in the 1970s and linked the sculpture to the Maestro della Santa Caterina Gualino. Previtali went public with the attribution in his articles of 1976 and 1984 respectively. It is now considered one of the artist’s finest works. Previtali’s inexhaustible interest saw the identification of a large family of works. The majority of pieces linked with the enigmatic Maestro della Santa Caterina Gualino are still preserved in situ in churches in both Umbria (e.g. in Logna di Cascia, near Perugia) and Abruzzo (e.g. in Sant’Angelo Abbamano and Guardia Vomano, near Teramo). 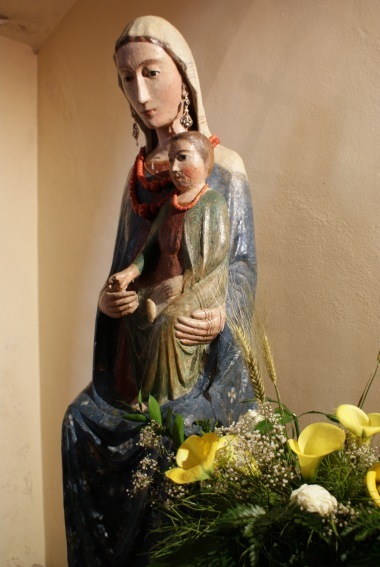 Some – such as, for instance, the Madonna and Child in the parish church of Montorio al Vomano, which is still adorned with flowers and draped in jewels – continue to play a role in popular devotion today. Mystery still surrounds not only our artist’s name, but also his origin. Did he come from Umbria or the Abruzzo, or somewhere else entirely? Where did he receive his artistic training? Was he a painter or a sculptor foremost? How big was his workshop, and how did it function? Where was it and who worked for him? The joint art-historical and technical investigation of the Edinburgh Madonna will help us answer at least some of these unanswered questions. Keep following us to find out more about our findings! National Museums Scotland are undertaking extensive art historical, analytical and conservation work to prepare the Madonna for display in our new Art of Living gallery, opening 8 July 2016. 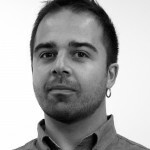 Dr Luca Palozzi, Dr Rachel King and our Collections Services department will explore the history and context of the object with the help of a Museums and Exhibitions Grant from the Association of Art Historians and monies from The Henry Moore Foundation. How do we know this “Maestro” is a he? Thank you Laura for your question. Naturally we don’t know if it is a he or a she, but the art historian who has worked on the objects, Giovanni Previtali, coined the name, the Master of the Santa Caterina Gualino. His assigning of the male gender to the craftsman is likely to have been based on his knowledge of workshop practice in the period. Indeed, coeval documents suggest the practice of sculpture was mainly – if not exclusively – the domain of men in Italy at the time. While it is possible that the person who made this piece was a woman, there is little evidence to date to suggest that women were heavily involved in the production of wooden sculpture in Umbria. National Museums Scotland uses the term Master/Maestro and refers to the sculptor as male because this is the accepted convention, but the very beauty of this project is that we might find out otherwise. Keep checking back here for new titbits and clues as we find them.